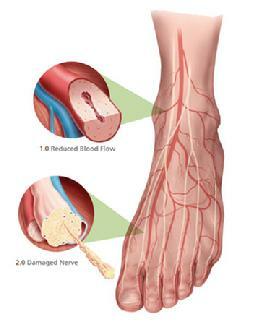 Vascular/Nerve Problems can be identified via symptoms in the feet. Close observation is needed to prevent conditions from worsening. Acrocyanosis is a persistent vasospastic disorder of the hands and feet. Blood cannot flow through and the skin will lack the oxygen it requires, resulting in dark blue to purple skin. If you are suffering from persistently cold hands and feet with a blue discoloration, contact Laser Podiatry Associates for a comprehensive evaluation. Don’t fret, Laser Podiatry Associates is just a phone call away. Treatment can vary depending on the severity of the disorder. Drs. Benjamin and Mullendore can recommend the proper course of action once an evaluation has been conducted. Alcoholic Neuropathy is caused by prolonged use of alcoholic beverages. Over time the nerves in the feet become damaged from the ethanol, resulting in loss of sensation. If you are suffering for any loss in sensation in your ankles, feet or toes, contact Laser Podiatry Associates for a comprehensive evaluation. Don’t wait! The damage to these nerves is permanent and may be avoided with early intervention. Laser Podiatry Associates is just a phone call away. Treatment can vary depending on the severity of the condition. Drs. Benjamin and Mullendore can recommend the proper course of action once an evaluation has been conducted. Chilblains (Cold Feet) is caused by the skin’s abnormal reaction to cold. Patients with poor circulation are more susceptible. If you are suffering from burning, itching, red swellings or breaks in the skin, contact Laser Podiatry Associates for a comprehensive evaluation. Don’t wait! If left untreated, the cracks in the skin can expose your foot to a risk of infection and ulcers. Laser Podiatry Associates is just a phone call away. Treatment can vary depending on the severity of the condition. Drs. Benjamin and Mullendore can recommend activates to increase blood flow, specific shoes and prescribe medications. Erythromelalgia is a rare disorder where blood vessels are open or dilated improperly and oxygen and heat of the blood is released into the tissues making them turn red and feel hot all the time. This can also be a very painful condition. If you are suffering from pain, redness and a hot sensation in your feet contact Laser Podiatry Associates for a comprehensive evaluation. Don’t fret, Laser Podiatry Associates is just a phone call away. Treatment can vary depending on the severity of the condition. Drs. Benjamin and Mullendore can recommend activities to make you feel more comfortable, specific shoes and prescribe medications. Ischemic Foot is the lack of blood flow from the heart to the foot, resulting in an inadequate amount of oxygen and nutrients required for the cells to continue to function. If you are suffering from cold feet, discoloration in the toes, muscle cramping contact Laser Podiatry Associates for a comprehensive evaluation. Don’t wait! If left untreated you can develop ulcers and experience pain. Laser Podiatry Associates is just a phone call away. Treatment can vary depending on the severity of the condition. Drs. Benjamin and Mullendore can recommend activities to increase blood flow, specific shoes and prescribe medications. Neuroma is a painful condition, also known as a “pinched nerve” or a nerve tumor. It is a benign growth of nerve tissue frequently found between the third and fourth toes. It brings on pain, a burning sensation, tingling or numbness between the toes and in the ball of the foot. If you are suffering from pain between the toes while walking, contact Laser Podiatry Associates for a comprehensive evaluation. Don’t wait! If left untreated, neuromas tend to get worse. Laser Podiatry Associates is just a phone call away. Treatment can vary depending on the severity of the neuroma. If identified early, you may be able to avoid surgical correction. Drs. Benjamin and Mullendore may be able to prescribe specific shoes to relieve symptoms and the condition can diminish, however in more severe cases surgical intervention to remove the tumor may be recommended. Spasms are sudden, intense muscle contractions of the feet and toes and can be extremely painful. If you are suffering from spasms contact Laser Podiatry Associates for a comprehensive evaluation. Don’t wait! Spasms can indicate a serious underlying medical condition. Laser Podiatry Associates is just a phone call away. Treatment can vary depending on the severity of the spasms. Laser Podiatry will focus on identifying the cause of the spasms and treat as needed. Drs. Benjamin and Mullendore may recommend or prescribe oral medication, proper hydration, vitamin or mineral supplements and/or light activities that relax the muscles. Venous Stasis is a condition where the veins in your legs and ankles lose their proper function to carry blood back toward the heart. This can lead to blood clots and result in swelling in the legs and ankles. If left untreated, ulcers can develop and become infected. The infection can spread throughout the body and if it spreads to the bone will increase your chances of an amputation. If you are suffering from swelling or cramping in your legs, a tired, weak or aching feeling in your legs or have painful varicose veins in your legs, ankles or feet contact Laser Podiatry Associates for a comprehensive evaluation. Don’t wait! Venous stasis can is a serious problem and lead to ulcers with further infections. Laser Podiatry Associates is just a phone call away. Treatment can vary depending on the severity of the disease. Laser Podiatry Associates will focus on relieving the pain and decreasing the swelling or edema and preventing further complications.